The 69 Eyes visited the Howlin Wolf in New Orleans on October 12. They are currently on tour with The Becoming and Dommin, promoting their new album, Back in Blood, which was released in September. Some of you may have heard of The 69 Eyes via Kat Von D’s promotion of the vampire rock band, maybe you are a fan of Bam Margera who did a beautiful, stylistic job as director of the music videos for “Lost Boys;” “Dead Girls Are Easy,” the first single off the new album, and the second single, “Dead and Gone,” or (as one fan shared with me) maybe you were listening to HIM on Pandora radio and, being a similar sound, The 69 Eyes caught your attention. Whatever the case they are worth a listen. Surely some of you are curious as to what they mean by vampire rock? 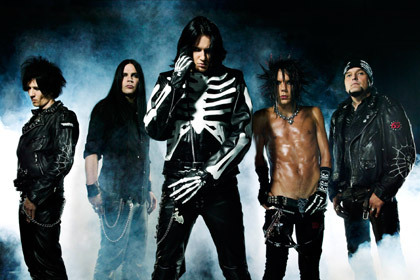 Jyrki (pronounced: yur-key) described the group as more of a cartoon rock band; their songs are not so much about love but about Jyrki’s favorite film genre–¬¬horror: more specifically, vampire flicks. The heart-throb front-man, Jyrki, is not only a vampire rocker but also holds a master of science degree in analytical chemistry, is a UNICEF Goodwill Ambassador and won the Outstanding Young Person of the World Award in 2006. As a Goodwill Ambassador he feels strongly about the education of children and talked about how important it is that children are educated: because if the children are knowledgeable and doing well, then mother earth is doing well. He said his being chosen for the role of Goodwill Ambassador was because he is more edgy and not someone “safe”, such as a sports star. He loves that he can be out doing his thing in a rock band while also doing something good. Their stage performance sounded just like their recorded music, and it was fun, as an audience member, hearing Jyrki, with his accent, pumping the crowd between songs. However there was a feeling, bleeding through their performance, that they were bored, and one could spot Jyrki thinking about doing his Elvis Presley and Michael Jackson-esque stage antics before and while executing them. Whether it was simply because of it being a rainy day or because they’ve been doing this for 20 years, one can’t be sure. It was evident they weren’t really into the performance until they began playing newer hits, such as “Dead Girls Are Easy,” during which the band definitely had more than enough overflow energy from the enthusiastic audience. With such a theatrical headlining band the opening bands were fitting. The Becoming came out with their own lights, glitzed us with their gold drum set and had a sound like Emery, if Emery was less punk and more Marilyn Manson. On stage just before The 69 Eyes and appropriately revving the crowed for the main event was Dommin. Theatrically dressed with leather jackets bowling shirts and slicked back hair the young, more mainstream, Depeche Mode-sounding band wowed the venue with their simple keyboard progressions, catchy lyrics to hit-worthy songs such as “My Heart In Your Hands.” Lead singer, songwriter and guitarist, Kris Dommin, shocked with vocals unique to the genre, giving the band a refreshing taste. Overall, a terrific show and, if you are in an area where this murder of bands is touring, it is worth your time and money to check out the show. If not, all three bands have music worthy of livening up your computer time or drive home from work. Previous Previous post: Do you want your music in Rock Band?